Kidlington Fire Station staff rescue Father Christmas! Purple for Polio eradication, bulbs planted in Kidlington. You are very welcome to attend future speaker events listed via the "Programme" link above. Please use the "Contact Us" link above and we will do the rest. 100 Club lights up a school. THE 100 CLUB - cash prizes every month and support the GAGA charity. Follow this link to find out how to join the 100 CLUB. £530 Christmas Gift to the North Oxfordshire Community Foodbank. The Marlborough Church of England School in Woodstock is a wonderful school in so many different ways. One of them is the Ormerod Base, which educates 25 young students with a variety of physical, emotional, and other learning needs. Recently one of the students, 13-year-old Leo Burbidge, walked a mile at Blenheim Palace to raise money towards a new school minibus. The big deal about that is that Leo has cerebral palsy, and was told that he would never walk. Over 150 members of Leo’s family and friends were at Blenheim to support him on the day, and so far he has raised over £10,000. 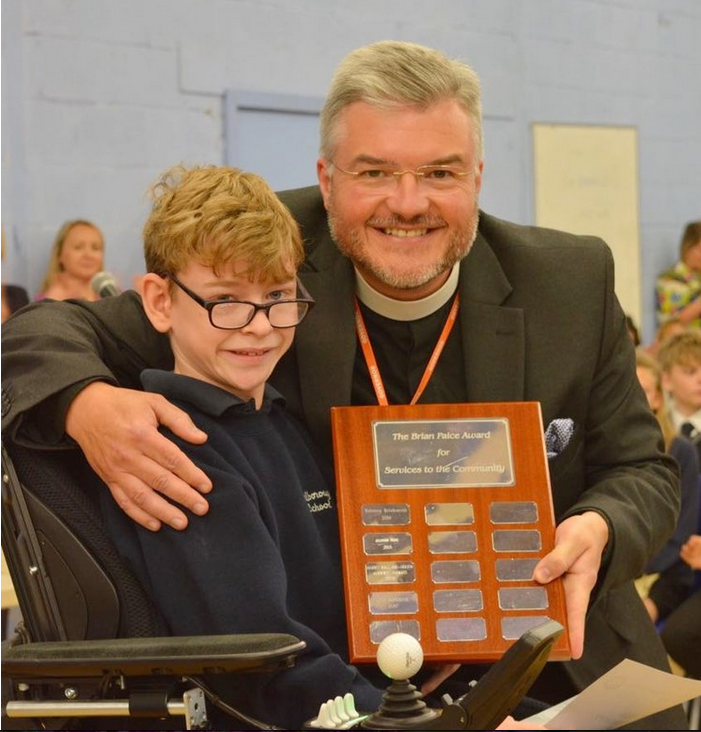 Our Rector, Adrian, is a Governor of the school, and recently had the privilege of presenting Leo with the Brian Paice Community Award in a special ceremony at school. ‘Leo is, quite simply, a legend’ says Adrian. ‘He is an inspiration to everyone – he put the needs of others first, and gave himself an extraordinary challenge, which he completed with flying colours. It is a joy to know him, and it was a great joy to be able to celebrate his amazing achievement’.